- A pair of Adidas black shorts, 12 - 16 y.o. Please [contact me] about any of these. 21/2/19: A huge congratulations to all our county winners in the Avon Schools Sports Hall Championships last Saturday. Thank you to all who attended and to parents and supporters who created such a great atmosphere. There were two Championship best performances in the U15 girls, both by athletes with another year in the age group. Maisie Johns set a new shot 3kg record of 11.20m which will take some beating and Lily Bailey knocked over 1 second off the previous 4 lap time in recording 53.7secs. Both obviously may have the chance to improve their records next year! 15/2/19: The following teams and reserves have been chosen to represent Avon Schools at the English Schools Cross-Country Championships in Leeds on Saturday, 16th March. Congratulations to all selected: [Teams + Reserves Selected]. Selection for this event was very difficult this year, due to the cancellation of the South West Championships. We have to limit the numbers in each team to 8 (rather than the 10 picked for the South West event) and take into account proven athletes who were not available for previous rounds. In selecting the teams we have taken a number of factors into account and believe that we have made the correct decisions regarding the teams. (1) Complete and send this [Confirmation, Consent and Kit Email]. If you have trouble with this link, the Letter to Athletes details the information we need which you can cut and paste into an email. If you are a Reserve, please would you [email us] to confirm that you would be able to stand by for this event up to Thursday 14th March. If, for any reason, you cannot run, please [email us] as soon as possible. 15/2/19 Refunds: If you paid for kit for the cancelled South West Championships, but will not be competing at the English Schools, you can either chose to have the kit anyway, or claim a refund. The £5 match fee is also refundable. Please complete this [preformatted email]. If you would like to receive your kit, it would be easiest if you could collect it from the secretary in Stoke Gifford (contact details will be sent in response). Sunday 3/2/19: Bath Racecourse has posted a photo [on their Twitter feed]. Friday 1/2/19 12:15: Saturdays' South West Schools Championships in Bath has been CANCELLED. The site lies atop a plateau, and the road from the north (from the M4) is closed completely. Access is possible but perilous up a steep narrow hill from Bath. There is deep drifting snow on the site, which claimed the organiser's car this morning. Avon Schools AA regrets that we cannot hold a safe and fair event. 20/1/19 South West Schools Cross-Country Information. Avon Schools AA are proud to be hosting this year's event, which will take place at Lansdown Race Course, Bath BA1 9BU, on Saturday 2nd February. Click here for the [Site Map and Parking<] and [Course Map and Timetable] (updated 27/1/19) . If you are a Reserve, please would you [email us] to confirm that you would be able to stand by for this event up to Friday 1st February. 22/1/19 Avon County Schools Cross-Country Results. These [results are here]. Please [let us know of any errors]. 25/1/19 Full results now available (with corrections), but still only times for first 12. Further times may follow. 14/1/19 The Avon Schools Sportshall Championships will take place at the BGS Sports Centre on Saturday February 16th. Please see this [Letter to Athletes] for details. 26/10/18 This coming 2nd. February Avon Schools Athletics Association are hosting the South West Schools Cross Country Championships at Bath Race Course. We will need a great number of people to put the whole package together. If you can help in some way, or know of someone who can help out, please contact Ken Holmes. 10/10/18 We now have a provisional fixture list for 2018-2019 on our [fixtures page]. Details will go out through schools (teachers only please consult the contact us page for district coordinators). 24/9/18 The AGM for Avon Schools Athletics Association will be held at Ashton Park School, Ashton, Bristol on Monday 8th October; 5.00pm for a 5.15pm start. The agenda for the meeting [is here]. It would be very helpful if at least one representative from each district should come along to this meeting. 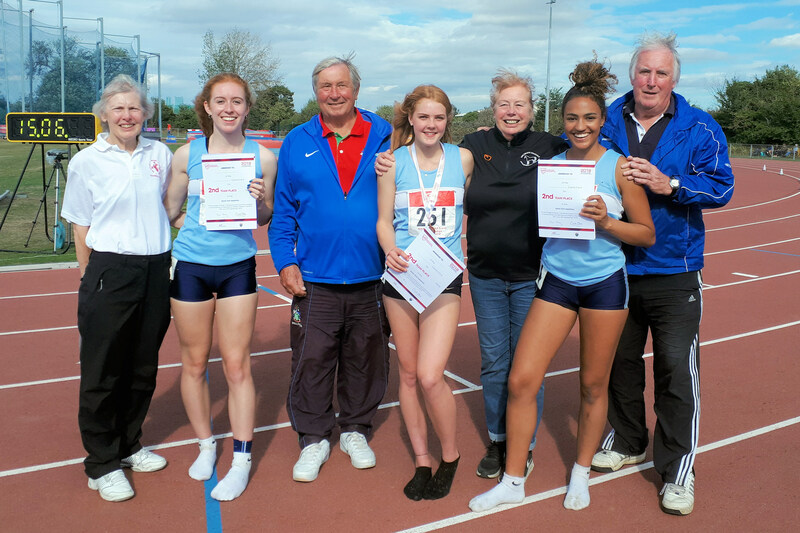 24/9/18 WELL DONE to our Senior Girls' Heptathlon Team, who finished second in the English Schools Combined Events Championships in Bedford on 15th and 16th September. A [full report is here], and below a photo of the team, coaches and managers. 31/7/18 Well done to all those who represented Avon Schools at the South West Combined Events Championships in Yeovil on 23rd and 24th June. [Results are here], and a report on [the event is here]. This event doubled as the Avon Schools Championships, and the Avon Champions [are listed here]. 31/7/18 Well done also to those who competed for Avon at a very hot English Schools Track and Field Championships in Birmingham on 13th and 14th July. Jess Lewis won the gold medal in the Junior Girls' Javelin in a championship best performance, while Luke Ball in the Junior Boys High Jump and Anna Burt in the Senior Girls 800m came away with bronze medals. We had 6 other top 8 finishers. Avon [results are here]. Full details about the event, including cost, kit, travel and payment, is contained in this [Letter to Athletes]. Important: Please note that there is a full team meeting on Monday, 9th July, and that we are leaving on Thursday, 12th July (see letter for details). (1) Complete and send this [Confirmation, Consent and Kit Email]. Please DELETE items not required / add sizes for items required, see letter for sizes. Please do NOT use strikethrough font! If you have trouble with this link, the Letter to Athletes details the information we need which you can cut and paste into an email. If, for any reason, you cannot take part, please [email us] as soon as possible. 17/6/18 Well done to everybody who competed for Avon Schools at the South West Championships yesterday, and thank you to all those who helped out. Provisional [track results are here], and [field results are here]. The Avon Team for the English Schools Championships will be announced here on Wednesday afternoon (at the latest). Sorry to make you wait, but there are a few details we need to finalise. 13/6/18 Helpers needed! To ensure the event runs smoothly, every county must provide helpers for Saturdays SW Schools Championships in Exeter. Avon provides the 'runners' who take results from officials to be processed, and onwards to be posted. We need two more 'runners' (could be a job share). We do have a lead who has done it before. Any volunteers please contact [Jim Strudwick]. 13/6/18 The timetable for Saturdays event in Exeter [is here]. 10/6/18 I'm sorry for the change of format and loss of old news - Serif's server seems to be down.